Earn up to 8,392 reward points. Lightweight, versatile design with plenty of low-end punch. 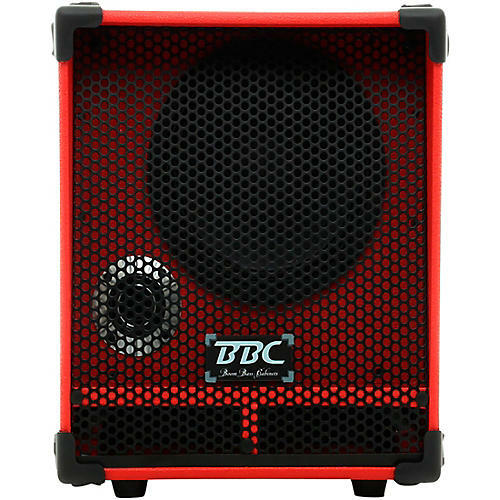 The BBC Tank 1212 is a 1,200W 4 ohm cabinet loaded with two 12 inch neodymium drivers and a 300 watt horn. For those who love the tight punchy low-end sound and the big, rounded mid tones that are sure to cut through the mix, this cabinet will deliver. This cabinet has extra sound ports on the lower sides of the cabinet that allow more sound from the lower woofer, it also has a unique interior structure design that allows the woofer to work at extreme high volumes with very little effort. The Tank 212 also features a tilt-back front baffle which allows sound to travel at a slight upward angle, perfect for the times when you have to stand close to or right over the cabinet. It comes standard with a retractable handle and our rear recessed corner casters for easy mobility, perfect for the working musicians. Dimensions: 21 x 17 x 18 in.